Dolphin spotting with Captain Casper the sea dog! From Scotland with the Wee White Dug, a tale of adventures in the Highlands, including the Pump Room and Spa Exhibition in Strathpeffer, a view of Castle Leod (seat of Clan Mackenzie), the Touchstone Maze honoring Scotland’s historic sites, a Moray Firth cruise with Dolphin Spirit Inverness, enchanting music at Embrace Gifts shop along with wood carvings at Victorian Station, the Eagle Stone of The Pictish Trail, and more. 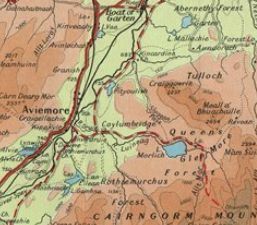 Just further proof, as if we needed any, that your Scotland trip deserves quality time in Inverness-shire and at least a glimpse of the Northern Highlands. Today I’m going to share with you an eclectic mix of Victorian spa town in the Scottish Highlands and a dolphin spotting adventure on the Moray Firth. Last Saturday after an early breakfast at our B&B near Portmahomack, we set off along the NC500 route between Tain and Dingwall to make the 34 mile journey to Strathpeffer. Strathpeffer lies a few miles west of Dingwall. The village sits in a wide mountain valley or strath. Leafy, and surrounded by mountains it has the look of an Alpine village to it. Arriving in Strathpeffer is like stepping back in time. The Victorians have left an instantly recognisable imprint on the architecture of the village. You half expect to see elegantly dressed ladies, strolling down the street on the arm of top hatted gents with mutton-chop whiskers.